– Unique campaign will showcase Valentine’s Day gift ideas from different advertisers to consumers across the UK. – Uses the flexibility of DOOH to creatively reach, engage and inspire shoppers. – Follows the successful launch of the first Christmas Gift Guide in Dec 2017. – In key shopping locations across the Adshel Live digital network. Following the successful launch of the first Christmas Gift Guide, Clear Channel UK unveils the first digital out of home Valentine’s Day Gift Guide. Utilising the creative capabilities of our digital Adshel Live network, this unique campaign will showcase gift ideas from different brands to inspire shoppers this holiday. The campaign will feature products from Gordons Pink and COTY Marc Jacobs and will run across our national network of digital Adshel Live screens across one week, delivering 9.6 million impacts. The original Christmas campaign was inspired by traditional printed Christmas gift guides that were then adapted to utilise DOOH’s creativity and flexibility. The Valentine’s Day Gift Guide utilises the same concept and has 10 second slots for brand images featuring subtle animation to drive cut-through and engage consumers. Located nationwide in over 60 cities in premium locations, the campaign will run during key shopping hours, targeting shoppers on busy high streets and roadsides. -Initial roll out offered for Clear Channel’s premium Storm products, now available for Out of Home (OOH) specialist Posterscope to check availability and pricing, option and buy inventory inside its own ECOS system. – The integration is a key milestone for Clear Channel’s automation strategy and vision for Creating The Future of Media, Out of Home. – Work has begun with other Out of Home specialists to integrate the platform with their own systems and for the platform to carry additional products from the Clear Channel Portfolio. Following the launch of the Clear Channel Ad Platform last year, the leading UK OOH media owner has connected its platform with Posterscope’s own location analytics planning and trading platform, ECOS. The direct connection simplifies the entire process of booking premium Storm inventory for the Posterscope team, from the initial checking of availability and cost, to placing options and purchasing. The API integration is the first Clear Channel UK has made with an OOH specialist and is an important next step as part of the company’s automation strategy. Clear Channel UK’s Ad Platform is a web-based portal, with access granted to authorised users. Inventory on the Platform is traded on an automated guaranteed basis. This means advertisers can access and buy fixed volumes of premium inventory with fixed, upfront pricing. Ad Platform, wholly owned and developed by Clear Channel UK, delivers data via the Open Direct Protocol, the IAB (Interactive Advertising Bureau) standard. This method has meant integration has been straightforward for both Clear Channel and Posterscope. Stephen Whyte, CEO, Posterscope UK added: “Planning and buying out-of-home can be logistically complex so anything that helps simplify the process and increase speed to market is welcome. Integrating our award-winning ECOS platform with Ad Platform will enable faster, more efficient planning and booking across Clear Channel’s digital estate, and, most importantly, allow clients to really leverage the flexibility and agility of digital OOH. Direct Line marketing director Mark Evans and Alison Jones, the newly-installed customer director at The Co-Operative Food, are joining 13 media and creative experts to judge the Outdoor Media Awards for 2018. The awards, now in their 12th year, are run by Clear Channel UK in partnership with Campaign magazine. They reward excellence in Out of Home advertising, from the most memorable, strategic and innovative campaigns to the brilliant people involved in creating them. There are nine categories in this year’s awards, including the new Rising Star Award. This award recognises those that have joined the world of Out of Home within the last 5 years and who are making waves within the industry. 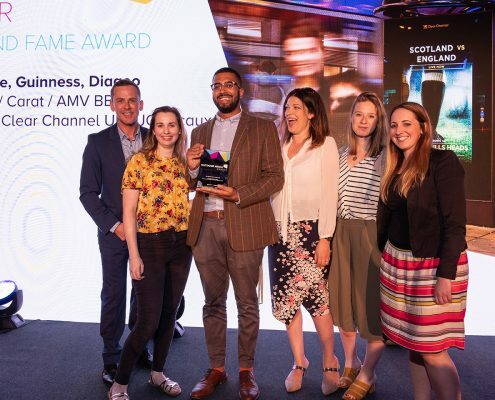 The judges will be reviewing all submitted entries and crowning the winners, including The Grand Prix winner who will receive £100,000 worth of media space to use across Clear Channel UK screens. The People’s Favourite Award is the only category that will not be judged by the judging panel, but by over 1,000 members of the UK public. The judging day, which will be chaired by Global Editor-in-Chief of Campaign, Claire Beale, will take place in early May, followed by the shortlist announcement later that month. Winners will be announced at the awards ceremony on Thursday 28th June at The St Pancras Renaissance Hotel. The awards are free to enter, and campaigns may be entered into multiple categories. Postimport http://ps-development.azurewebsites.net/wp-content/uploads/2017/09/Posterscope_Logo_White-2.png Postimport2018-02-06 14:26:152018-02-06 14:26:15The Outdoor Media Awards 2018 judges announced! The roll out comes as part of Clear Channel’s continued commitment to transforming and enhancing high streets across the UK. As the new kiosks are installed, hundreds of aging phone boxes are being removed, decluttering the streets of the West End, with new units add to the growing nationwide Adshel Live network, providing an essential public utility. As part of their commitment to transforming and enhancing UK highstreets, Clear Channel will be responsible for installation, cleaning and maintenance of the units, at no cost to the public, as is already the case with the thousands of bus shelters, Adshel and Adshel Live screens across the country. Unique campaign will showcase Christmas gift ideas from six advertisers to 6.2 million consumers across the UK. Uses the creative capabilities of DOOH to reach, engage and inspire shoppers. First of its kind campaign running nationwide on 900 screens in key shopping locations across Adshel Live digital street furniture network. The campaign showcases products from six advertisers and is currently running nationwide across 900 screens from Adshel Live’s digital street furniture network located in premium locations targeting shoppers on busy high streets and roadsides. The first of its kind campaign was inspired by traditional printed Christmas gift guides and the concept has been adapted to utilise DOOH’s creativity and flexibility. Each 10 second spot includes all six brands in creative reminiscent of the traditional gift guide layout, and features subtle animation to drive cut-through and engage consumers. The campaign will be live during shopping hours and will be played out 2 million times during its two week run, reaching an estimated audience of 6.2 million people. Clear Channel UK pledges to show significant support for one partner charity every Christmas, via their new initiative, “The Christmas Charity Partnership”, by donating a significant volume of relevant inventory, for a single festive campaign. The media owner pledges to give significant support to one chosen charity over the festive period, in the form of a campaign delivered on the relevant inventory, to suit the target audience that the charity wants to reach. Clear Channel has strong links with the communities it operates in. They are focused on helping improve the infrastructure of local communities, and develop partnerships with charities and sponsor local causes, and are committed to helping dozens of charities every year, so this new initiative does not affect any existing charity partnerships. London’s Air Ambulance is the first such charity to benefit from the Christmas Charity Partnership. They are the charity that delivers roadside advanced trauma care to critically injured people in London, serving the 10 million people who live, work and travel within the M25. On average their medics treat 5 seriously injured people every day, and have attended over 37,000 patients who needed urgent medical intervention since their creation in 1989. Via helicopter or rapid response car, an advanced trauma doctor and paramedic is delivered to the patient, bringing the hospital emergency department directly to scene. Providing the 24/7 service costs £10 million per year, mostly funded through charitable donations. The Christmas Charity Partnership campaign will run in London, on Storm, Clear Channel’s super premium large format digital portfolio. The aim of the campaign is to increase awareness of the charity amongst people in London, in the hope they will support London’s Air Ambulance’s life-saving cause, during this season of goodwill. It was founded in 1989 and to date has treated over 37,000 critically injured people and attended most major incidents. It serves the 10 million people who live, work and travel within the M25. Barts Health NHS Trust employs and remunerates the doctors who are seconded to the service, as well as providing some direct financial support and the helipad facility for the charity’s operations. London Ambulance Service provide paid paramedics who are seconded to the service. An advanced trauma paramedic operates from the Service’s control room and is responsible for dispatching London’s Air Ambulance to the most critically injured people in London, 24 hours a day. Clear Channel UK is a market leading Out of Home media owner with more than 40,000 sites nationwide. Clear Channel UK has a dedicated team of more than 650 people working in 14 locations nationwide. Clear Channel UK continually finds new and interesting ways to help brands meet people throughout the UK, on our classic and digital platforms. Clear Channel UK’s vision is to Create the Future of Media, Out of Home. Justin Cochrane, CEO, Clear Channel UK said: “We’ve been delighted by the success of My Town, having received hundreds of entries so far, and I’ve been hugely impressed with the calibre of photography submitted from both amateur and professional street photographers. Clear Channel International (CCI), one of the world’s largest outdoor advertising companies, has partnered with the United Nations (UN), providing a wide variety of prime digital Out of Home (DOOH) advertising space across 16 markets worldwide for the UN’s global humanitarian #NotATarget campaign. The campaign ran from the 16 to 19th August, and aims to tackle the targeting of civilians in war. In the United Kingdom, the campaign ran across Clear Channel UK’s super premium digital brand, Storm, in London.